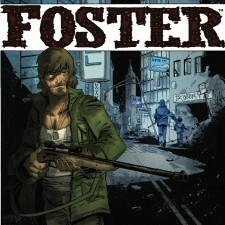 OSSM Comics, the Santa Monica based start-up comic book publisher, has acquired the publishing rights to Brian Buccellato’s creator-owned graphic novel FOSTER. Set against the backdrop of late 60’s/early 70’s urban crime movies, FOSTER follows a haunted war veteran who finds himself the guardian of a 6 year-old boy being hunted by a shadowy race of brutal creatures, rising up from the darkness. The graphic novel, written by Buccellato (the NEW YORK TIMES bestselling co-writer of FLASH and DETECTIVE COMICS) with art by Noel Tuazon (TUMOR), will be published by OSSM Comics on July 2, 2014. It will be the first time that the entirety of the story will be in print; Dog Year Entertainment originally published five issues of a planned 6-issue mini-series. FOSTER will retail for $12.99. OSSM stands for Omar Spahi Santa Monica, but it’s also a play on “awesome.” (Now you can hear it, right?) CEO & President Omar Spahi was born in New York in 1988 and grew up in Santa Monica, CA. The company’s motto? Redefining Awesome. When he’s not running OSSM Comics, Omar owns and manages a property management company and recently purchased part of Hi De Ho Comics, a local comic shop in Santa Monica. Like anyone who is simultaneously running three businesses, Omar is passionate, driven and ambitious. Omar was in part inspired to write and publish comics after his mother died from breast cancer when he was 18. His goal is to honor and celebrate her memory — and help make it socially acceptable to talk about death. THANIEL, the latest release from OSSM Comics, is the story of a high-school dropout on a very troubled path that only gets more complex when he discovers that his father is the Grim Reaper himself. Issue 1 went on sale on April 9. THANIEL is the first of four releases from OSSM Comics is the 2014. “OSSM Comics has always been about more than comics, it’s about people and the way people grow and change,” said Omar. “We’re all constantly transforming. We do our best to publish stories that change people lives and help them become the person they aspire to be. Back in February 2014, Omar hired comic book industry veteran Siike Donnelly (BLEEDING COOL; HOLLYWOOD REPORTER; SOLESTAR creator) as OSSM’s Editor-In-Chief and marketing director. In addition to editing and marketing titles, Siike is also writing the new OSSM series MONOMYTH (art by Eric Ninaltowski), due this July from OSSM. As a brain aneurysm survivor, Siike brings a unique perspective to his role at OSSM, “Imagine not being able to close your eyes and conjure up these beautiful worlds we all try to create. That’s me. I close my eyes and I’m stuck in darkness. I don’t know what a horse or a superhero looks like. I have to go online and look them up before I can fully describe them. So my writing comes from an emotional place, since it can’t come from the physical, as does my art. I have to be mad to write a character that is angry. I have to be sad to write a sad character. It’s like method acting almost. I am my characters and they are me too.” In addition to his role at OSSM, Siike is currently running a Kickstarter campaign for his art book project ELAN VITAL about the first robot that gets a soul and begins a journey to find himself by creating art. The first issue of MONOMYTH goes on sale on July 23, 2014.